Sidney firefighters punch holes into a house to better reach a massive house fire at 223 N. Walnut Ave. in Sidney late Tuesday evening, March 26. Responding to the fire were the Botkins Fire Department, Anna Fire Department, Lockington Volunteer Fire Department and the Van Buren Fire Department. The fire took over an hour to fully extinguish. Water pours down on two firefighters during a massive house fire at 223 N. Walnut Ave. in Sidney late Tuesday eveneing, March 26. Responding to the fire were the Sidney Fire Department, Botkins Fire Department, Anna Fire Department, Lockington Volunteer Fire Department and the Van Buren Fire Department. The fire took over an hour to fully extinguish. Sidney firefighters pull a fire hose closer to a massive house fire at 223 N. Walnut Ave. in Sidney late Tuesday evening, March 26. Responding to the fire were the Botkins Fire Department, Anna Fire Department, Lockington Volunteer Fire Department and the Van Buren Fire Department. The fire took over an hour to fully extinguish. 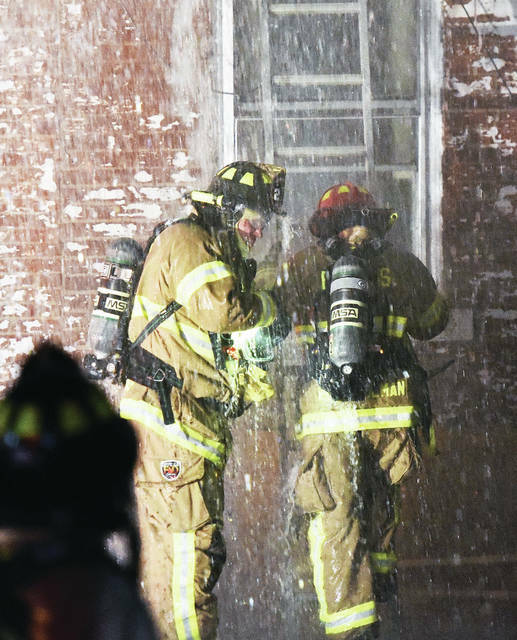 Sidney firefighters finish knocking out a house fire at 106 N. Pomeroy Ave. that started shortly before 10 p.m. Tuesday, March 26. 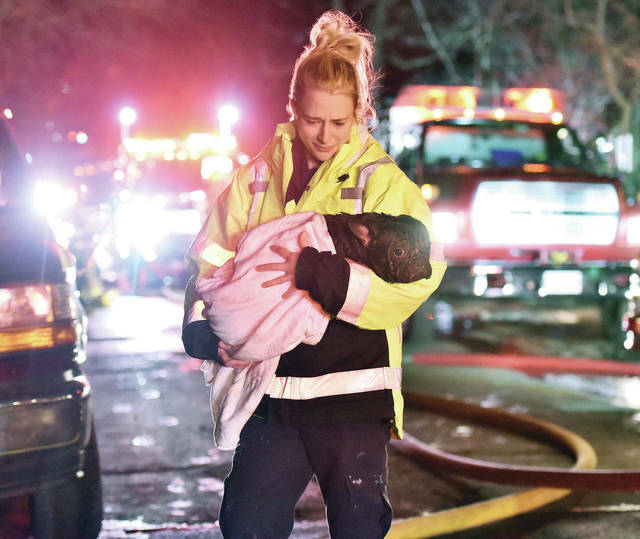 Perry Port Salem rescue EMT Kelsey Beam carries a very wet and cold dog away from a house fire at 223 N. Walnut Ave. in Sidney late Tuesday evening, March 26. Responding to the fire were the Sidney Fire Department, Botkins Fire Department, Anna Fire Department, Lockington Volunteer Fire Department and the Van Buren Fire Department. The fire took over an hour to fully extinguish. Firefighters battle a massive house fire at 223 N. Walnut Ave. in Sidney late Tuesday evening, March 26. Responding to the fire were the Sidney Fire Department, Botkins Fire Department, Anna Fire Department, Lockington Volunteer Fire Department and the Van Buren Fire Department. The fire took over an hour to fully extinguish. 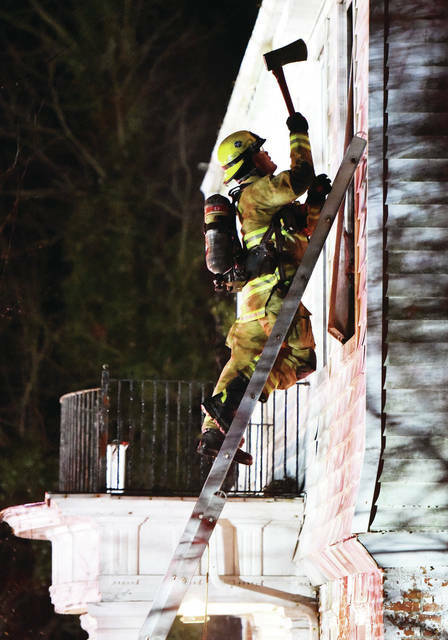 A firefighter knocks out a window with an axe while putting out a massive house fire at 223 N. Walnut Ave. in Sidney late Tuesday evening, March 26. 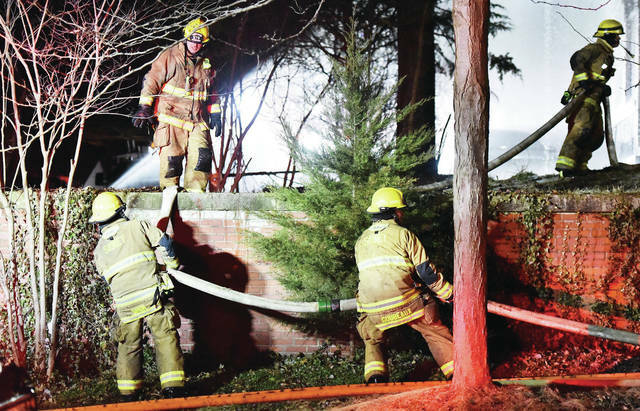 Sidney firefighters battle a massive house fire at 223 N. Walnut Ave. in Sidney late Tuesday evening, March 26. Responding to the fire were the Botkins Fire Department, Anna Fire Department, Lockington Volunteer Fire Department and the Van Buren Fire Department. The fire took over an hour to fully extinguish. 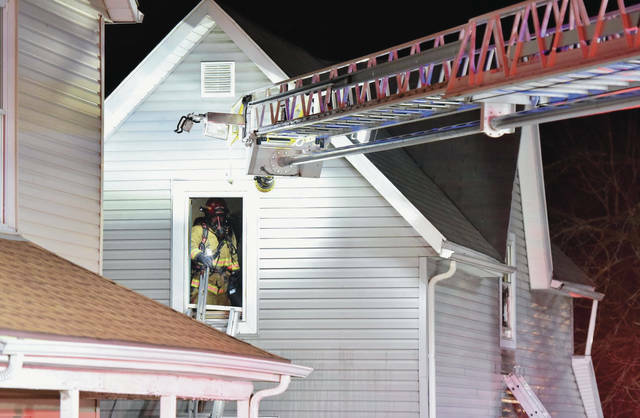 SIDNEY — Sidney firefighters, along with firefighters from four other departments, were kept busy Tuesday night when they responded to two house fires, which were within two city blocks of one another. 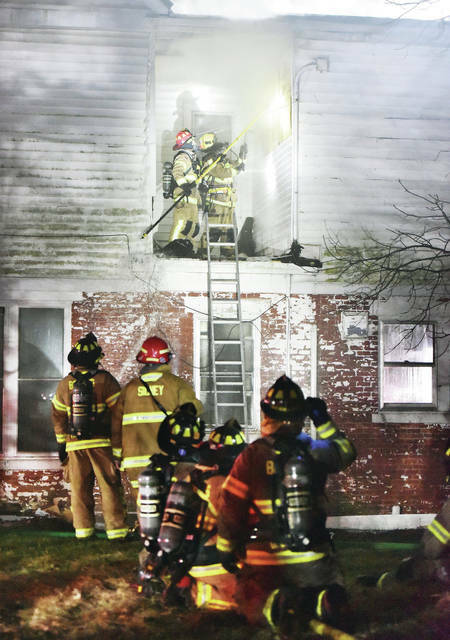 The alarm for the first fire at 106 N. Pomeroy was received at 9:40 p.m., while the second alarm for the fire at 223 N. Walnut Ave., was received at 10:23 p.m. Reports said 18 dogs were rescued from the Walnut Avenue fire. According to Assistant Chief Chad Hollinger there were 70 firefighters and EMS personnel on the scene of both fires. Sidney called in all off duty firefighters to battle the blazes. They had 28 firefighters on the scene. Anna Fire Department sent trucks and 10 firefighters, while Lockington and Botkins Fire Departments sent 12 firefighters each along with trucks. Van Buren Township Fire Department sent six firefighters and Perry Port Salem Rescue sent five EMS personnel. Firefighters were first dispatched to 106 N. Pomeroy Ave. The single-family, two-story residence had heavy smoke coming from the two second floor windows when firefighters arrived on the scene. They confirmed all occupants were out of the home and determined the fire was located in a second floor room. The fire was quickly contained and extinguished. A box alarm was dispatched to recall all off duty Sidney firefighters as well as Anna Fire Department, Lockington Fire Department and Perry Port Salem Rescue Squad. Vectren was called to the scene to secure the gas and DP&L to secure the power. 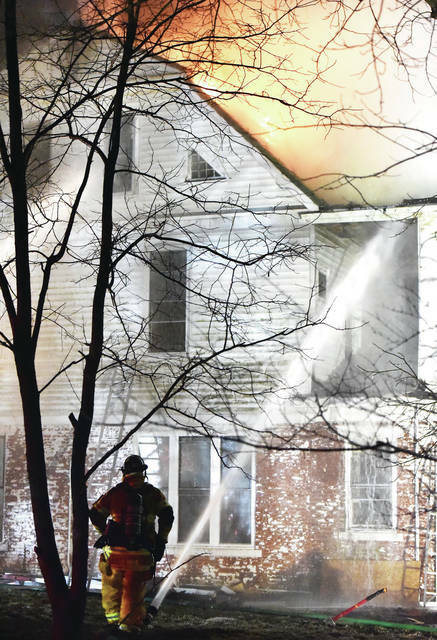 The large two-story, single-family residence on Walnut Street had a well-involved attic fire when firefighters arrived at the scene. Flames were shotting out of the attic/roof area. Sidney Police officers confirmed that all the occupants had been evacuated from the residence. When Sidney firefighters arrived, they found heavy smoke and fire coming from roof of the structure. Firefighters battled the well involved attic fire for approximately three hours before it was brought under control. Extensive salvage and overhaul operations were completed to protect the property of the residents and to insure that no hidden fire remained. Vectren and DP&L were called to the scene to secure the utilities to the structure. Red Cross was called to the scene to assist the occupants with any immediate needs. 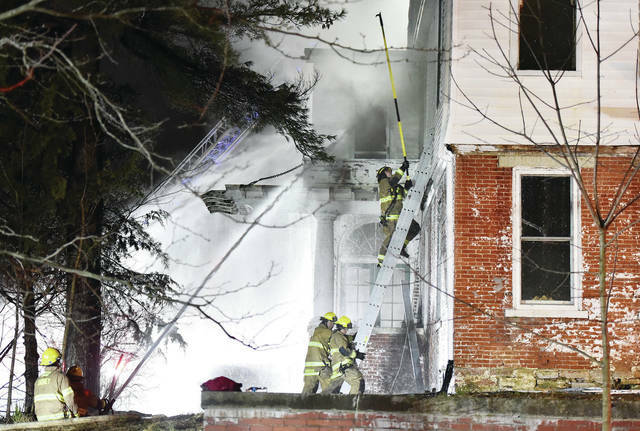 “Because the Walnut Street house was an older structure and it had some remodeling done to it, there were a lot of void spaces, which made finding the hidden fires more difficult,” said Hollinger. The home received fire, smoke and water damage throughout the structure. Damage was estimated at $167,000 to the structure and $50,000 to the contents. Firefighters were still on the scene at 7 a.m. on March 27. The cause of the fire is under investigation by the Sidney Fire Investigation Unit. Investigators are expected to be on the scene the majority of Wednesday investigating the cause of the fire. There were no reported injuries to civilians or firefighters during the firefighting operations. Numerous dogs were removed from the structure and placed in the care of the Shelby County Animal Shelter. According to Hollinger, the fire at the Pomeroy residence has been ruled accidential. The total loss to the property is estimated at $25,000 and to contents $5,000. “We don’t believe there’s any connection between the two fires,” said Hollinger. Hollinger said there were no injures to the occupants of either residence nor any firefighter. “I believe no animals were injured either,” said Hollinger. A rehab unit was set up by the Sidney Fire Department to make sure all the firefighters received food and drinks to sustain themselves as they fought the fires, said Hollinger. Hollinger said this was the most personnel on hand for a fire in the city since the downtown fire involving the Sidney Dance Company building. Other large fires the department has fought includes a triplex on Westwood; and two arson fires on South Miami Avenue and Oak Avenue. An arrest and conviction was made in the Oak Avenue fire.